We just celebrated ONE YEAR of living on the road, our nomadiversary, on 5/5/11. How? With cake of course! A specialty cake right, made just for us? Um sure. We found a cake decorated with some kids' movie or show or something (I'd never heard of it), but we thought it looked like the Mojave Desert (one of our favorite campsites), so we went with that! We used Josh's truck and RV for the top, and tada! 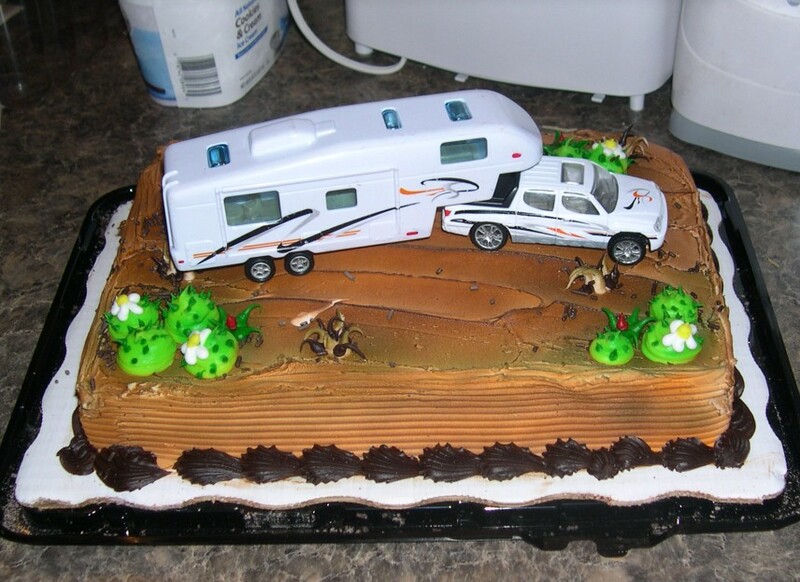 The perfect (for us) RVing cake! Who knew a cactus could be so yummy?! A year! And we're still loving it, the awesome, the boring, all of it. But especially the days that include chocolate cake! Wow..a year already..does not seem that long ago..congrats my traveling friend! !..and I want some of that cake!! So awesome! Congrats! We seem to have encountered another set back... we'll see. Fabulous! A whole year. The cake looks really yummy and I adore the camper on it!